Plant taxonomy classifies Angelina stonecrop as Sedum rupestre 'Angelina.' Sedums are referred to by the common name, "stonecrop" plants, although "sedum" itself is so widely used as to be virtually a common name. 'Angelina' is the cultivar name. Angelina stonecrop plants are flowering, succulent, evergreen perennials. Angelina stonecrop is a fast-growing plant that stays short (around 6 inches tall) and quickly spreads to form a mat, making it an easy-to-grow ground cover. It might not bloom the first year that you grow it, but, when it does bloom, it produces clusters of star-shaped yellow blooms on tall flower stalks (early-to-mid-summer). During most of the growing season, the needle-like foliage will be chartreuse or golden, depending, in part, on the amount of sun it is getting (the more sun, the more golden it will be). It starts out golden in spring. Tints of orange or rust may come into the foliage in fall. Angelina stonecrop keeps its succulent leaves all winter in a zone 5 garden (although, if buried in snow, you may not be able to appreciate it). Some list Angelina stonecrop as a perennial for zone 7 and higher; others, more daring, suggest it can be grown in zone 6. This gardener's own experience refutes both claims as overly cautious: You should be successful at growing Angelina stonecrop in planting zone 5. Grow these sedum plants in full sun to partial shade, in a well-drained soil with a neutral soil pH. 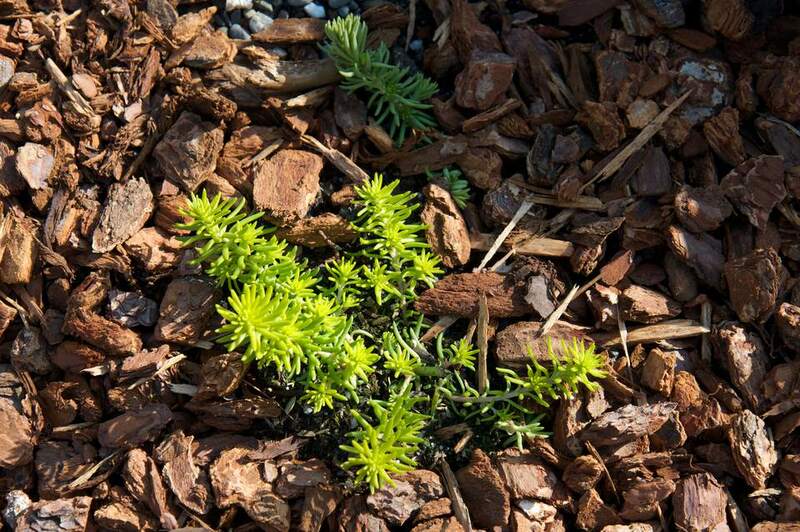 Angelina stonecrop is a drought-tolerant ground cover once established. Its golden foliage is promoted by a location in full sun. Because of its chartreuse or golden foliage color, this sedum looks especially good when combined with plants that have dark or reddish foliage. For the same reason, a red mulch will set off Angelina stonecrop. Mass the plants together for use as a ground cover or perennial border. Nice rock garden plants, these succulents can also be planted between the stones in a dry-wall stone retaining wall. You will also see them planted in patio containers and hanging baskets, too. Butterflies are attracted to Angelina stonecrop; deers, fortunately, are not. Angelina stonecrop plants are easy to grow, and these perennials are easy to propagate by rooting. In fact, stems that break off sometimes root all by themselves. The plants may spread over time, so this plant may not be for you if you are seeking something that is super well-behaved. Prune them whenever (if ever) you feel they have become too large. The yellow flower clusters are reasonably attractive, although the flower stalks are awkwardly tall. But once the blooms fade, you are left with rather ugly brown stalks, which some like to remove for aesthetic reasons. "Stonecrop" is from the Middle English and literally means "sprouting from the stone," a reference to the plant's commonly being seen growing amongst stones (which provide the drainage that stonecrop plants crave). "Stonecrop" doubles as the name of the family to which the genus, Sedum belongs. "Sedum" itself derives from this same observation of where stonecrop plants tend to grow. It comes from the Latin, sedere, meaning "sit"—as in "sitting" atop the stones. Did You Know Tiny Bunchberry Is a Dogwood?